Jun Kamoda - Blind Disco. Vinyl EP. Bleep. Japanese stalwart Jun Kamoda, previously of Illreme and Baleine 3000 fame, continues his dabblings with Black Acre. The title track is a raucous affair, it's hi-life licks and pounding Afro-house rhythm sounding like something from Soundway Records after a shot in the arm. ‘Ramen Funk’ is a cosmic techno workout full of thick basslines and more disco-hi-life guitar lines. 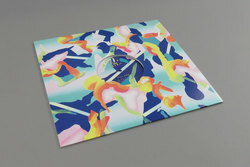 Final track ‘Savanna on the Palm’ applies the cosmopolitan globalism of the other two tracks to a cut that steers a closer to a Berlin/Amsterdam vibe without ditching any of Kamoda’s playfulness.